We’re proud to stock these fabulous craft kits from The Make Arcade, all designed and packed in their cosy Salisbury studio. Modern, fun, fabulously packaged and all with excellent instructions, these make perfect presents or a great crafty treat for you. This kit uses a midi sized 4” wooden embroidery hoop and full and simple instructions to cross stitch the ‘Hello Coffee’ slogan in a bold black colour. This lettering is accompanied by a cute mid century style coffee pot in warm hues. 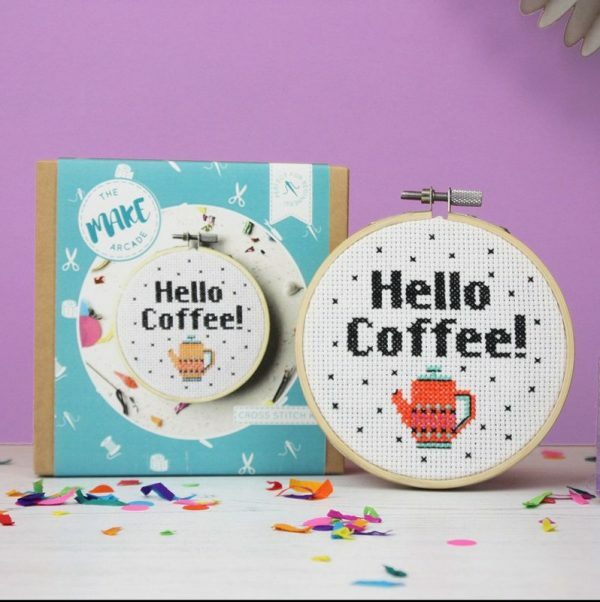 The finished cross stitch can be hung up on the wall or propped on a shelf with your lovely vintage teaware – perfect for kitchen shelves! The kit comes packaged in a sturdy kraft box for you to store your stitching in if you get disturbed mid task andmaking it great for journeys and holidays or a fun secret santa gift or witty stocking filler for girlfriends, mums or sisters! !